This is big, and this is serious. What if your home pantry looked like this… and there was nowhere else to go? Our O’Fallon Corps Community Center in Missouri sent us this picture. They feed 935 families per month–that’s over 400% increase over the last two years. But in June, all was well: they got 20,000 Ibs of food donated. And for those families who had nowhere else to turn, that was a good thing. This month, they got 3,900 Ibs of food and that’s it. Now O’Fallon, and many other Salvation Army corps community centers in the St. Louis region, are at risk of turning those families away. Whether it is a donation of food or of dollars, this is a critical need that we need your help to fill. We need your help right now to feed your neighbors throughout the region. We’re sending out an SOS: please Stock Our Shelves! MOST NEEDED ITEMS: dry goods (pasta, rice, cereal, etc), canned meat and protein items. If you would like to help or have questions, please email dana_biermann@usc.salvationarmy.org. If you’re going to spend your free time on social media anyway, why not tweet for good? Come out to the Rooftop Terrace Bar at the Moonrise Hotel on May 21, from 6:00 – 9:00 p.m., #TweetTheMostGood alongside Social Media Club St. Louis, and hear Don Hutcheson from Panera Bread talk about the Meal of Shared Responsibility. Learn how St. Louis-area bakery-cafes are helping to fight local food insecurity one Turkey Chili Sourdough Bread Bowl at a time! Tickets are only $5.00, fully donated to Salvation Army of St. Louis, and free appetizers will be served until 7:00 p.m.
Can’t make it but would still like to help? Visit our page to make a donation but we’d love to see you there! 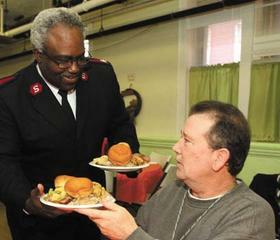 This article is written by Ashley Kuenstler, Content Specialist for The Salvation Army Midland Division. When you step foot inside the O’Fallon Worship and Community Center, the first thing you will notice is the smell. If you allow your nose to guide you, you’ll weave your way through tiled hallways until you find the source. And on this particular day, it was roasted chicken, homemade mashed potatoes, and freshly baked bread. These are the types of reactions Ayla Rashad w orks every day to provide to the families of the O’Fallon shelter. Through some kitchen appliances, cooking utensils, and a variety of ingredients, Rashad has been serving up comfort to shelter residents for five years. Rashad creates home-cooked meals twice a day for approximately 30 people. Each meal consists of a meat, vegetable, starch, bread, and dessert – all from scratch. And on Fridays, she works double-time and prepares meals for the entire weekend. If you ask her to talk about this seemingly stressful job, she will illuminate the room. Rashad is passionate for not just her food – but the shelter residents as well. She enjoys getting creative in the kitchen to keep residents on their toes and ensure they enjoy every meal. Employees and clients alike agree that Rashad is the facility’s cornerstone, bringing people together around a dinner table for fellowship on a daily basis. When it comes to her cooking, there are only two things she won’t do: make boxed meals or use a microwave. During her tenure with the shelter, Rashad said her role was put into perspective when a neighbor from her childhood was a resident there. To learn about how you can help cook at our Worship and Community Centers, please visit our Volunteer page. This year, nearly every location of The Salvation Army is reporting former donors who are now coming to The Salvation Army for aid. Young professionals and those who were nearing retirement who gave faithfully for years are finding themselves without a job, or with a depleted retirement fund and are having to come back to the organization they’ve long supported, this time seeking aid. Over and over this year, our case workers have shared with us that clients who may be seeking food pantry assistance are reluctant to accept Christmas help, because they are holding out hope that things will get better for their families prior to the holiday. We pray for each of our clients and their families that the economy will return once again strong and that there will be jobs enough for all who want them, but we want to encourage all clients and prospective clients who are presently in a tough spot to reach out and get the aid they need for the holidays. We are offering just three more days to apply for holiday assistance – whether it be toys for your children or a holiday meal, we have programs that can help. Please take the aid we have to offer and give back one day when you’re in a better place. It is an honor for us to give a hand up to individuals this holiday season, and to ensure that no child goes without on Christmas morning. On November 28 to 30, we will accept our final applications for holiday aid. If you or someone you know is in need this holiday season, we ask you to come out and let us share our gifts and prayers with you this season. Call 314-646-3000 for more information, or reach out to your nearest community center to schedule your appointment. May God bless and keep you and yours this holiday season. The Salvation Army has addressed unprecedented need in Missouri and Southern Illinois, both in response to natural disasters and the general economy. The Greater St. Louis Boy Scouts of America will host their annual “Scouting for Food” event this month. On Saturday November 12, 1.4 million bags will be distributed to as to homes throughout the St. Louis area. On November 19, Scouts will pick up non-perishable donations and deliver them to the St. Louis Area Foodbank. The Salvation Army and many other local food pantries will benefit from the bounty that you give to this very worthy youth organization. The initiative has the very lofty goal of collecting more than 2 million cans for 500 pantries, and it cannot achieve that goal without your support. Please visit http://www.stlbsa.org/programs/sff/Pages/Scouting-for-Food.aspx for additional information on this event and how you can help. Tornados, earthquakes, floods, civil unrest, and the list goes on. Whatever the disaster may be, you may need to survive on your own once a disaster strikes. This means having your own food, water, and other supplies in sufficient quantity to last for at least four days. Relief workers will be on the scene after a disaster, but they cannot reach everyone immediately. Help may come in hours, or it might take days. In addition, basic services such as electricity, gas, water, sewage treatment, and telephones may be cut off for days, weeks, or even longer. Water. One gallon of water per person per day for at least four days, for drinking and sanitation. Food. At least a four-day supply of non-perishable food. Can opener. Dustmask to filter contaminated air. Prescription medications, aspirins and glasses. Important documents (or copies) of insurance policies, identification and bank account records in a waterproof, portable container. Include paper and pencil. Sleeping bag or warm blanket for each person. Additional bedding if you live in a cold-weather climate. Complete change of clothing including a long sleeved shirt, long pants and sturdy shoes. Additional clothing if you live in a cold-weather climate. Household chlorine bleach and medicine dropper – When diluted 9 parts water to 1 part bleach, bleach can be used as a disinfectant. Have these items ready, and you can be ready for anything!